March 21, 2005 1200 PST (FTW) – Have you ever wondered why China is willing to go to war with the United States over an island located a little over 100 miles off the coast, perched between the South China Sea and the East China Sea? Certainly, Taiwan has been a thorn in China's side since the remaining nationalists fled there following the rise of the People's Army. But China has tolerated the island's de facto independence - with a certain amount of saber rattling - until recently. Now China's demands for the return of Taiwan to the People's Republic are becoming more strident, and the world's most populous country appears prepared to back up its threats with force. Why is this? Is it because of Taiwan's strategic position, so close to mainland China? But China tolerates other US protectorates within its vicinity (including Japan and South Korea). Is it because of Taiwan's industrial might? Mainland China no longer has any reason to envy Taiwan's industrial riches. Is China suddenly ready to go to war over principles, following Taiwan's refusal to join with the mainland and its insistence (backed by the US) upon sovereignty? Is this really worth risking a war which might very well go nuclear? Or is there a more vital reason for China's bellicose insistence that Taiwan give up its claims of sovereignty? Could the answer lie in China's growing energy demands and the dwindling hydrocarbon reserves which once powered the mainland without imports? In the past few years, China has suffered a series of brownouts and blackouts caused by increased energy demand and diminishing supplies. 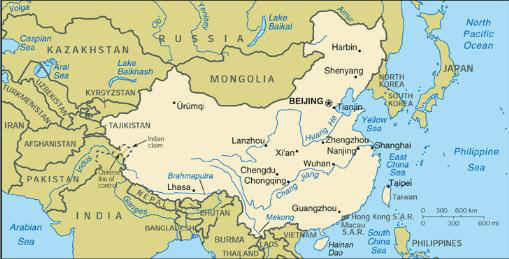 Mainland China has been thoroughly probed for previously undiscovered deposits of hydrocarbons. Those which have been found are either small or too distant to be of practical importance. In particular, China is making plans to drill the large deposits found in the Tarim Basin, but it will take many years before this oil brings relief to the industrialized east. And the output of the Tarim Basin will always be limited by the capacity of the pipeline that will bring this oil to market. Finally, the cost of oil from the Tarim Basin will be a stiff price for Chinese industry to pay. So China must look elsewhere for deposits which can be developed quickly, and more economically. And the areas where it would like to concentrate its search are the East China Sea and the South China Sea, where it is believed that there are several smaller but still worthwhile deposits which could quickly be brought online. The following image helps us to locate Taiwan (black) in relation to mainland China. Remember, Taiwan lies only a little over 100 miles off the coast of mainland China. Now let's look at an image of the continental shelf in the region of China and Taiwan. Clearly there is a conflict between the territorial claims of The People's Republic of China and Taiwan. If Taiwan is recognized as sovereign and its claim to a 200 mile exclusive economic zone is granted, then it will cut out a significant chunk of China's exclusive economic zone. While the disputed zone does not appear to be a likely area for oil exploration, it would set a dangerous precedent with regard to China's other territorial claims if it ceded to Taiwan on this issue. Specifically, it would damage China's position with regard to the Spratly and Paracel Islands in the South China Sea, and with regard to the Xihu Trough in the East China Sea. China cannot afford to lose these resources, and for this reason it might be prepared to use force if Taiwan insists on sovereignty.